Size of this preview: 605 × 600 pixels. Other resolutions: 242 × 240 pixels | 999 × 990 pixels. W. of Cwm Croesor. Acid (granophyre) sill forms main feature with cleaved mudstones on either side mostly hidden by grass. Cnicht summit in distance. current 11:45, 6 June 2014 999 × 990 (203 KB) Dbk (Talk | contribs) W. of Cwm Croesor. Acid (granophyre) sill forms main feature with cleaved mudstones on either side mostly hidden by grass. 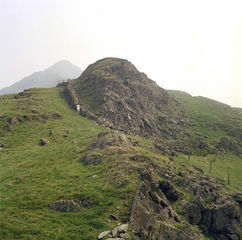 Cnicht summit in distance. This page was last modified on 6 June 2014, at 11:45.